Cheryl B. Gartley is the founder and president of The Simon Foundation for Continence, founded in 1982. The groundbreaking work, including a twenty city media tour upon the publication of the first book written for the public, Managing Incontinence: A Guide to Living with Loss of Bladder Control, lead the way to bringing public awareness to this long neglected health issue. Ms. Gartley also co-founded Simon Canada in 1986, now the Canadian Continence Foundation. She began and currently edits The Informer, a newsletter about incontinence and was creative director for the early 1990 film, The Solution Starts with You, that aired on television. She was a panelist (and co-author of the Consensus Statement) at the 1988 National Institutes of Health’s Consensus Development Conference on Adult Urinary Incontinence. Ms. Gartley is a widely published author with articles in journals such as The Lancet, Urologic Nursing, Journal of Clinical Psychology in Medical Settings, EP (Exceptional Parent) and Social Work Today. Articles about the Foundation and her work have appeared in such national publications as Time Magazine, Good Housekeeping, and the Ann Landers Column. She has traveled extensively in Europe, Japan, Australia, New Zealand, Canada and the USA on behalf of people with incontinence. On her travels she presents keynote addresses and has appeared internationally on hundreds of radio and television talk shows, including networks shows such as ABC’s 20/20 and Good Morning Australia (Sydney). In 2007 in partnership with Professor Alan Cottenden (Technical Director of the Continence and Skin Technology Group, University College London, England), Ms. Gartley launched the unique conference series, Innovating for Continence: The Engineering Challenge. 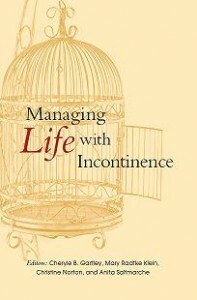 She also authored chapters and was co-editor of the Foundation’s newest book, Managing Life with Incontinence. Ms. Gartley is a contributing member of Committee 21, Continence Promotion, Education & Primary Prevention, which authors a chapter in the International Consultation on Incontinence (ICI)’s book, Incontinence, now in its 5th edition. Ms. Gartley has been recognized in: Outstanding Young Women of America and The World Who’s Who of Women and is the recipient of the American Urological Association’s Brantley Scott Award. She has a BS in education, and did her graduate work at the University of Chicago Graduate School of Business.